Brimful Curiosities: Wordless Wednesday - Flowers Anyone? Saturday was May Day. We made some baskets for the neighbors using a neat template I found on Skip To My Lou. My daughter enjoyed running to the door, hanging the basket on the knob and running away. Turns out, we especially helped cheer up one of our neighbors. The day before we brought the flowers, she broke her foot. After all the smiles and thankful comments we received, we will be making this a yearly tradition. My preschool daughter also decided she wanted to do something special for her teacher for Teacher Appreciation week. 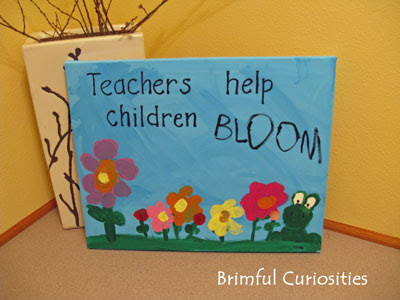 She loves to paint and painted this "Teachers help children BLOOM" picture. The only thing I helped with was painting the words. Seems we're spreading lots of cheer with flowers this week! We enjoyed making and distributing may day cone baskets of flowers as well. Yours were so colorful and beautiful! I would LOVE to have you as a neighbor! What a sweet project that that could be a wonderful family tradition! Aww, VERY cute idea! I don't think any of our college-age neighbor kids would be as nearly appreciative as yours were! How very nice of you all. I love the baskets! What great gift ideas! They are so sweet! I'm sure your neighbors and your daughter's teachers were very grateful. Thanks for stopping by for WW and leaving a comment. I really appreciated your support and kind words. Very cute craft, I may have to steal this! I remember doing the May Day thing! How fun!!!! I just love it! 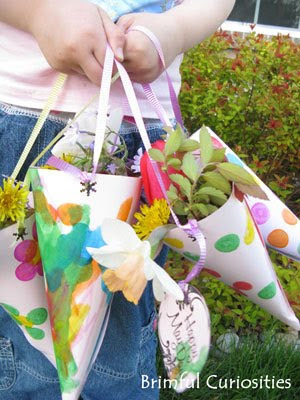 The cone baskets are so sweet - what a great idea! This may be perfect for my sister's upcoming wedding too! When broxton is older, we will have to do this.. I love May Day! I think the idea behind it is so lovely and such a great opportunity to bring happiness to our neighbors and friends. That canvas is adorable too! You can never spread too much happiness! Those are darling little may baskets and I'm sure the neighbors loved them. Aww. I love the May Day baskets. My daughters enjoyed suprising our neighbors with Easter Lillies on Easter. Isn't it wonderful to brighten somedays day with an unexpected surprise! Sglad you came by to visit, I'm following your site and love the creative and fun ideas.